Famous for: hill station, pilgrim centre, trekking, photography, scenery. Entrance Fee: No entrance fees. Set amidst beautiful landscapes and the surrounding magnanimity of the Western Ghats; Kurishumala is a religiously revered place considered to be holy. Apart from Kurishumala, Thekkady houses some of the most famed tourist spots in Kerala. Make sure you carry valid ID proofs with you. You might need them to gain access to some of the attractions in Poovar. Even if you don’t it is necessary that you have proper documentation with you while travelling. Pack accordingly to the season which you have chosen to visit. Always choose comfortable clothes so that you will be left free to explore the beautiful landscapes of Poovar. Also, don’t forget your swim suits and sunscreen, you will need plenty. You must carry a first-aid kit with you especially if you are travelling with your family. Kids often have the tendency to fall down and hurt themselves. Trust me; you will need the bandages to cover it up. Now, this I don’t think I need to specially mention to you but this is a reminder just in case you forget amidst the hustle and bustle of packing. I assure you that you will have a lot of moments to capture so do make sure that you have your camera with you. Carry handy medicines, especially if you are on prescribed drugs or medication. This is especially important if you have elderly people or children accompanying you. It’s time for some contemplation and if you are up for some soul searching then head out to Kurishumala. Kurishumala is not all for religious purposes. After the peak religious season, Kurishumala is left alone and during this time you can trek to the peak and enjoy a few hours in seclusion. The peak which is 1200 metres above sea level provides a perfect vantage point of take-off for Para-gliders. The rugged terrain and protruding rock gives you the perfect opportunity to try out some rock climbing. Plan a picnic with your loved ones, overlooking the borders of Kerala and the peaks of Western Ghats in the surrounding landscapes. Thekkady being a favourite tourist hub is never short on guides. You can avail the expertise of a guide to explore the unexplored and less traversed terrains of Thekkady. If you are travelling to Thekkady as part of a tour package, then imparting a guide for your trip is their responsibility. Kerala is one of those rare places where you can visit at any time of the year. This year-round destination packs a load of fun, no matter what the season. The months from March to May are generally the summer season in Kerala and the temperature is as high as 35 degree Celsius. The monsoon in Kerala falls in two phases. The first monsoon season will be from June and lasts up to August. The second phase of monsoon falls from October to November. The winter begins in December and extends till the month of February. So, as you have guessed the best time to visit Thekkady is after the onset of winters and also in the summers. But recent climatic changes have led to a temperature increase and slight changes in the pattern of weather conditions. So, I would suggest for you to check the climate before you plan your trip. Anyways the winters are fairly pleasant and welcoming. Even though Thekkady is a favourite tourist hub, there are no direct trains to the hill station. The nearest railway station to Thekkady is in Kottayam. You can get down at Kottayam Railway Station and the distance between Thekkady and Kottayam Railway Station is approximated at roughly 120 kms. This distance can be easily covered by a cab. You can also avail local transportation facilities as buses frequent this route on a regular basis. However, I would personally suggest a cab, because this is more convenient especially if you are travelling with family. India especially Kerala, is known for her religious concord. Here, different ethnic and cultural groups reside in perfect harmony. Quite interestingly, there is a trio of hills in Thekkady known as Murugan Hill, Thangal Hill and Kurishumala. 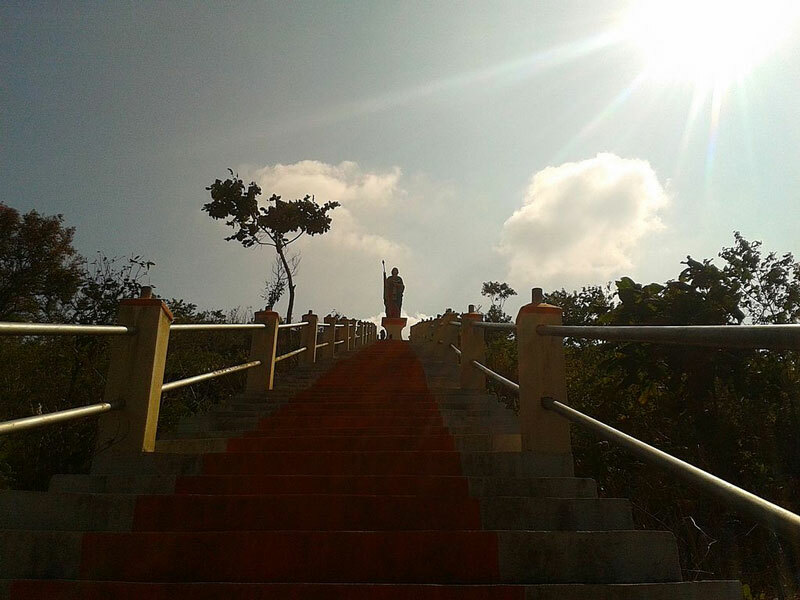 The Murugan Hill is dedicated to the Hindu deity Murugan- the son of Shiva and Parvati; the Thangal Hill is a holy site dedicated to the tenets of Islam; and Kurishumala is dedicated to Lord Christ and the tenets of Christianity. Records have not attested whether this is a natural rock formation or whether consciously planned. It makes one humble enough to bow down in front of the revered. Kurishumala is a famed pilgrim centre, and it is believed that if devotees undertake fast and climb the hill, it is certain that their wishes will be granted. The climb to Kurishumala is quite hard and a challenging expedition. The hardships you have to face are plenty. The terrain is forever changing and the paths are narrow with deep gorges on both sides. The very air of Kurishumala is known to have healing powers. 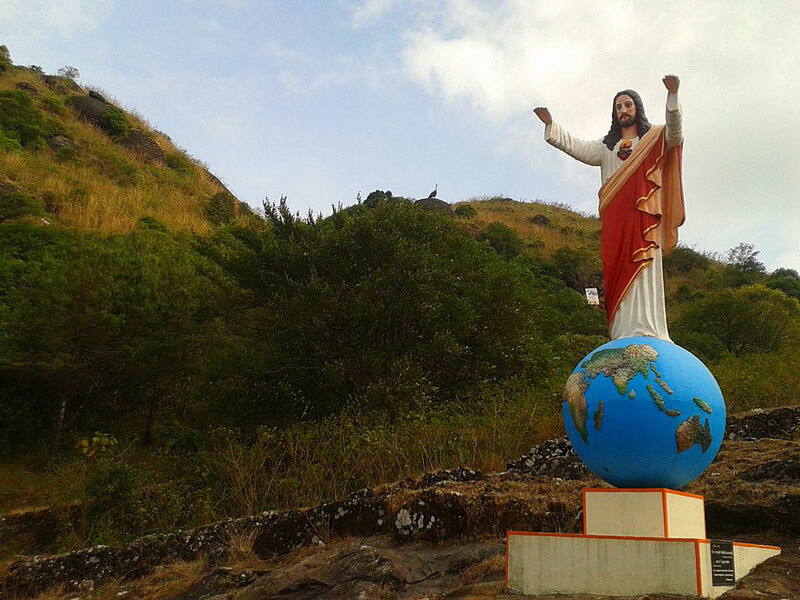 While some believe that this is due to the unique balance of the eco system in Thekkady, others attribute this to the sacredness of the Cross Mount. Set amidst the beautiful Ghats, Kurishumala and its surrounding hill ranges is the epitome of religious harmony which is a characteristic feature of all Indian states. It is not all about religion here, it is about a greater message that all religions have imparted to their followers; of brotherhood, love, passion and tolerance for the greater good of humanity.